Asparagus with Green Sauce – Dig Delve – An online magazine about gardens, landscape, growing & making. The green sauce in this recipe is not the well known mediterranean salsa verde, but Grüne Sosse, a speciality of Frankfurt introduced to me by our friend Ariane, a native of the city, and a neighbour in Bonnington Square for many years. It is traditionally served with asparagus of the forced white variety, which is particularly prized in Germany, where Spargelfesten are held in its honour every spring. 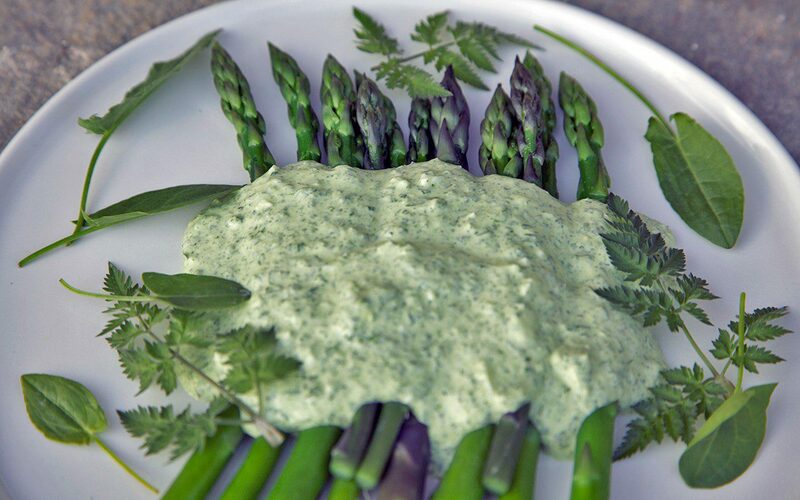 Although green sauce made from a variety of herbs can be found in German restaurants all year round, it is only in early spring that the truly authentic sauce can be made, when the herbs required are coming into their prime and the paper packages of them required to make it are found in farmer’s markets, together with the white asparagus which it traditionally accompanies. Genuine Grüne Sosse requires seven specific herbs; sorrel, chervil, chives, parsley, salad burnet, cress and borage. However, it is seldom that any of us have access to all of these herbs, and so substitutions can be made. The crucial thing is to ensure a good balance of flavours, with the requisite amount of sourness, freshness, bitterness and spice. There is no hard and fast rule about how much of each herb to use, but a rule of thumb is that no one herb should make up more than 30% of the bulk. When possible I try to get a fairly even balance between all of them, but you should adjust to taste and to what is available. Since it is so plentiful in our fields I use wild sorrel (Rumex acetosa), which I suspect is what the authentic recipe calls for, however you can replace this with the more usually grown French or garden sorrel (Rumex scutatus). If neither of these are available you could use young chard or spinach leaves and an extra squeeze or two of lemon juice. When it is available I use wild chervil instead of cultivated. Otherwise known as cow parsley (Anthriscus sylvestris), it is perfect to pick right now, and can be substituted for garden chervil (Anthriscus cerefolium) in salads or sauces for chicken and fish. If you are an inexperienced forager you must be extremely careful not to mistake poisonous hemlock for cow parsley. 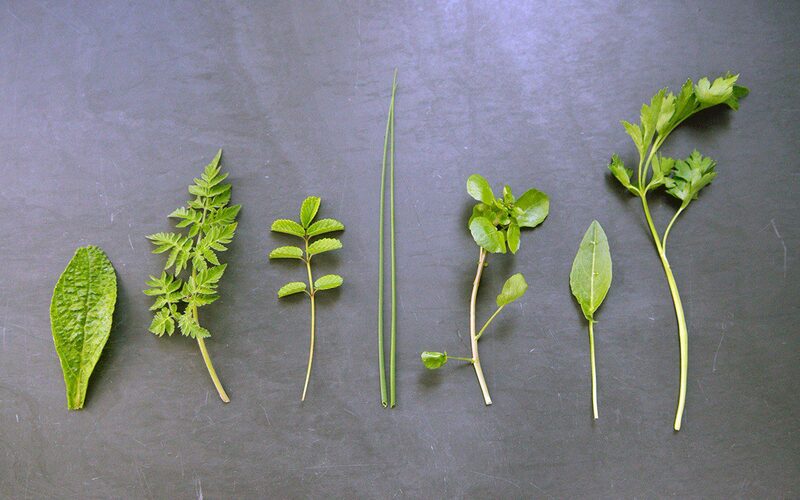 Use a good field identification guide (Miles Irving’s The Forager Handbook and Roger Phillips’ Wild Food are invaluable) and, if in doubt, do not pick it. In place of chives I use wild onion (Allium vineale) from the fields, being careful to pick only the youngest quills, as the older ones are tough. 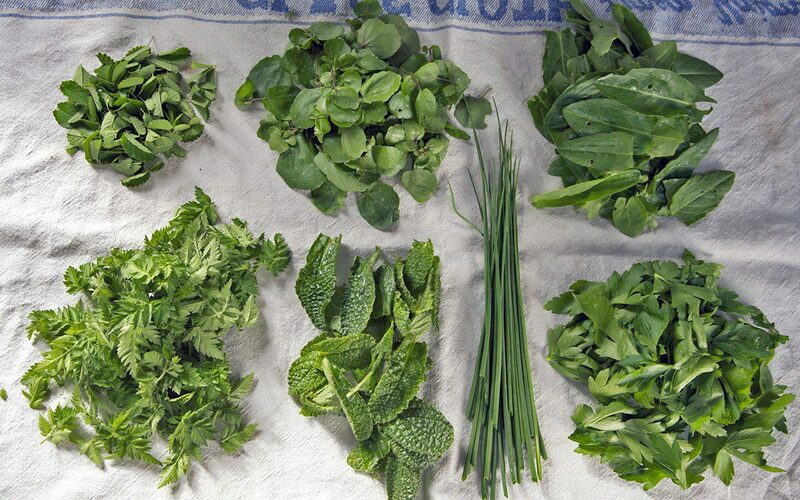 The cress can be replaced with watercress, rocket or even nasturtium leaves, to provide the peppery note. And, from the hedgerows, I have also used the leaves of garlic mustard (Alliaria petiolata), young dandelion leaves and even nettle tops, when the other herbs are hard to come by. The salad burnet and borage both impart a distinctive cucumber flavour which it is not possible to replicate with other herbs and which is particular to this sauce. When unavailable I have used peeled and finely grated cucumber in their place. Salt it and squeeze the juice from it before incorporating, to prevent it diluting or curdling the sauce. It is also possible to make up the quantities with more easily available herbs such as dill, fennel, tarragon or mint but, with their pronounced flavours, these should all be used in moderation or they will overwhelm the flavour. This sauce is also traditionally served with boiled new potatoes and halved hard boiled eggs, or as an accompaniment to boiled beef or poached fish. Wash the herbs. Put them in a salad spinner and then dry on a tea towel or paper towel. Peel the eggs and put the yolks in a mixing bowl. Coarsely chop the whites and reserve. To the egg yolks add the lemon juice, 2/3 of the herbs, 1/4 teaspoon salt and the yogurt . Liquidise using a hand blender. Stir the sour cream into the mixture. Add the coarsely chopped egg white. Finally add the remaining finely chopped herbs. Season with more salt and lemon juice to taste. If possible allow the sauce to rest in the fridge for an hour or so for the flavours to combine. Allow to come back to room temperature before using. Gently bend the asparagus spears until they snap. Trim the broken ends. If necessary finely peel the lower sections of the stalks of the outer fibrous layer. Put water to a depth of 2cm into a lidded sauté pan that is wide enough to take the asparagus in a more or less single layer. Bring to the boil. Put in the asparagus and simmer until tender. For thicker or older spears this may take as long as 5-6 minutes. Fine spears and those just picked will take far less, 2-3 minutes at most. Take the asparagus from the water and spread out on a paper towel on a plate to drain and cool quickly. Arrange the warm asparagus on plates. Spoon over some of the sauce. Decorate with reserved herb leaves. Eat with fingers.